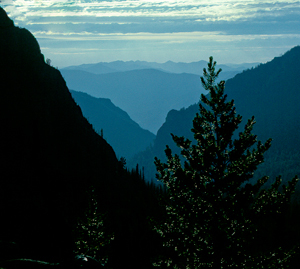 The conference will discuss How did the Wilderness Act of 1964 become public law? What kind of framework did the Wilderness Act establish? How has the Wilderness Act functioned during the past fifty years? What challenges to the Wilderness Act should be considered for the future? Idaho’s senator, Frank Church, sponsored the Wilderness Act, and in 1964 he was the floor manager of the bill as it passed the U.S. Senate. In Idaho, his greatest achievement may have been the establishment of the River of No Return Wilderness area, the largest in the lower 48 states at 2.4-million acres. This is slightly larger than Yellowstone National Park. After the senator’s death, the wilderness was renamed the “Frank Church/River of No Return Wilderness,” or just “The Frank” to many. The keynote speaker will be historian Douglas Brinkley. Also attending will be Chief of the Forest Service, Tom Tidwell and former governor Cecil Andrus. Andrus, who served 4 terms as Idaho governor, will be honored. He played a key role in the battle to secure the River of No Return Wilderness in the crucial 1979-80 time period. At the time Andrus was Secretary of Interior. In addition to the keynote speech. There will be three panels filling the day, Monday. The first is on the passage of the Central Idaho Wilderness Act of 1980, which established the Frank. Panelists include former Democratic congressman from Idaho, Larry LaRocco who played a key role in establishment of the Gospel Hump Wilderness in Idaho. Also on on the panel will be Craig Gehrke, Idaho Regional Director of the Wilderness Society; Rick Johnson, Executive Director, Idaho Conservation League who served on boards of the Campaign for America’s Wilderness; the American Wilderness Coalition; Advocates for the West; and the Wilderness Support Center; Dr. Ralph Maughan, former chair of the Sierra Club Northern Rockies Chapter; a founder and former president of the Greater Yellowstone Coalition; president of the Wolf Recovery Foundation; and Vice President of Western Watersheds Project. Maughan is also author of numerous books on backpacking. The last panelist will be Doug Scott, wilderness advocate formerly with The Wilderness Society, Sierra Club and the Pew Charitable Trusts; author of The Enduring Wilderness: Protecting Our Natural Heritage through the Wilderness Act; and Wild Thoughts. A book by Dr. Maughan entitled Charles Manson was an Environmentalist, on the fight to protect what became the Frank, came out this month. It is available at Amazon.com. The other two panels will feature discussions on the history of wilderness areas and the future of wilderness. More on the conferences is in the Idaho Statesman at Garry V. Wenske: Celebration of Church’s landmark U.S. law will be special. Guest Opinion. Ralph Maughan: If it were offered to you by some future far-sighted President, would you accept the job of being the U.S. Secretary of Interior? — Many, including myself, would second that nomination. Why thank you, Ed! I don’t like being an administrator, but if I was asked to fill the Secretary of Interior’s job, it would be yes! yes! My quote above is by Plato, not Lao Tzu. I should have known, as its about 15 words too many to be Lao Tzu. Sorry……..
Ralph, you would be a great secretary of interior! Yes. I hope we get an update on the conference! I am still traveling home from it — on the road. I might not have been paying attention lately but the new book is news to me. Sounds interesting. When I first read this, I immediately saw immense irony. Frank Church would be drummed out of the 21st century GOP for his efforts to preserve wilderness! Frank Church was a Democrat. Wasn’t Church also the last Democratic Senator to represent Idaho?